An overhyped weather system brought a little light snow to the Finger Lakes overnight and will bring a secondary area of snow tonight. 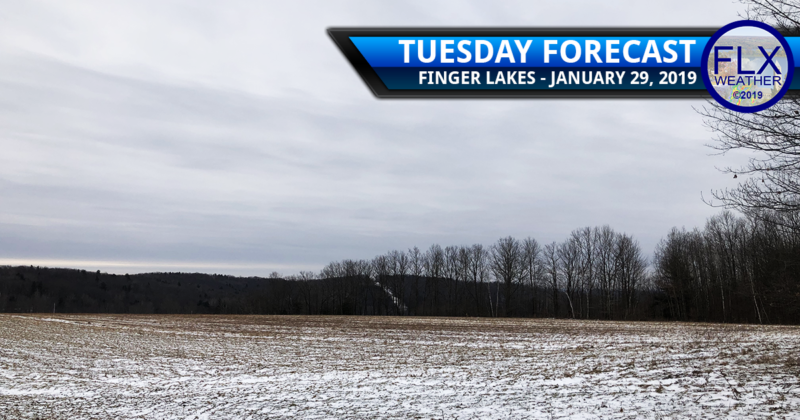 For most of today, the Finger Lakes will be dry with just a couple intermittent flurries from time to time. It will remain cloudy and blustery with a south wind gusting over 30 mph at times. The wind will turn to the southwest later this afternoon and speeds will drop. As this wind shift occurs, temperatures will drop from around or just above 30 degrees into the low and mid 20s. During the mid to late afternoon, snow will increase over the eastern Finger Lakes. Areas west of Seneca Lake will continue to only see a few scattered flurries. Steady snow will fall for several hours with just a couple inches falling. The snow will taper off before midnight. Outside of a few stray lake effect flurries, this should be the last snow most of the Finger Lakes sees this week. Temperatures will steadily fall through the night. By Wednesday morning, the Finger Lakes region will be bisected, with temperatures just above zero in northern areas and just below zero across the south. Wind chills will be between -10 and -20 degrees. Wednesday’s temperatures will rise just a few degrees with highs mostly in the single digits. Wind speeds will drastically increase though. Widespread gusts over 40 mph are possible and a few western areas could approach 50 mph. This will keep wind chills below zero throughout the day. The wind will decrease some Wednesday night with gusts in the 20-30 mph range. The entire Finger Lakes region should drop below zero by Thursday morning, with negative teens across the Southern Tier. This will produce dangerous wind chills of -20 to -35 degrees Thursday morning. Frostbite can occur in 15 minutes or even less with wind chills that cold. Wind chills will remain below -10 degrees throughout Thursday with high temperatures in the low and mid single digits. Friday morning will be a touch warmer than Thursday morning with fewer negative teens and a couple areas near Lake Ontario staying at or just above 0 degrees. Wind chills will be between -15 and -25 degrees. Our weather will start to moderate after that, with mid teens for highs Friday, at least 30 degrees on Saturday, and 40s on Sunday and Monday. One final note for those traveling outside of the Finger Lakes region. Lake effect snow off Lake Ontario near and just south of Watertown, and off Lake Erie near and just south a Buffalo, will be significant Wednesday and Thursday. Blizzard conditions are likely with the strong winds. Travel will be impossible in some areas due to the heavy snow, strong winds, and extreme cold. If you must travel in the lake effect snow belts this week, a winter survival kit is strongly recommended.